This article will review the next 3 games in the Unlock! series and will not go into detail on how to play Unlock!. 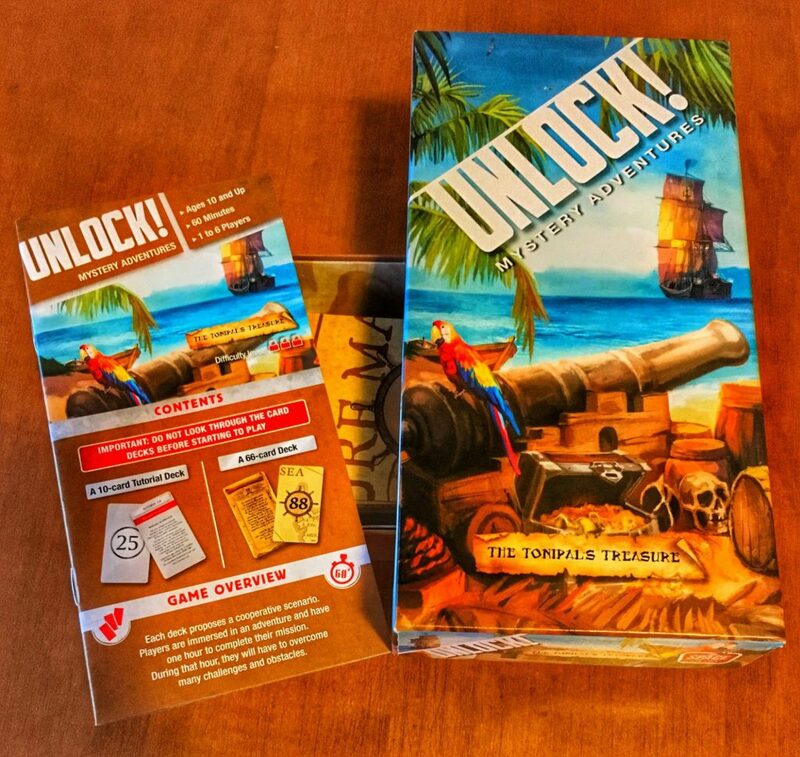 If you are unfamiliar with the system, read our review of the first games in the series to learn how to play and get the most out of your Unlock! experience. Unlock! 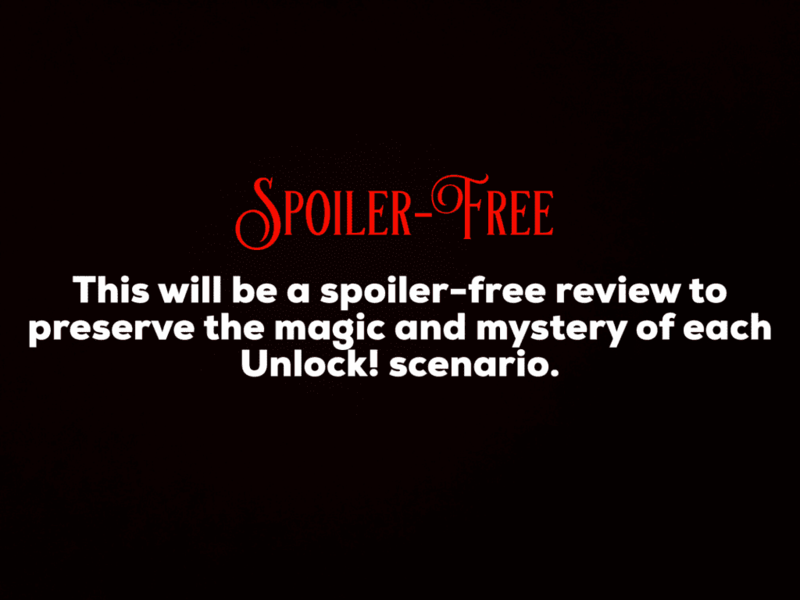 Mystery Adventures consists of the next three games in the Unlock! series (The House on the Hill, The Nautilus’ Traps, and The Tonipal’s Treasure), released in English in late 2017. In each of these scenarios, you are no longer asked to simply escape your circumstances; you must also solve a mystery. Difficulty Level: 1 out of 3. The difficulty level in The House on the HIll is fitting; it wasn’t too hard, there weren’t too many hidden objects, and there was a mix of logic and real-world puzzles. The theme in this scenario had potential: enter the haunted house, find what the book has unleashed, and stop it from terrorizing the town. Unfortunately, the story and theme were essentially nonexistent and it never felt like we were doing any of that. In fact, when we got to the end and “escaped”, we wondered if the ending we received was what we were supposed to have accomplished. I was disappointed there were no Machines in The House on the Hill, especially since one puzzle should have been a Machine instead of a yellow card. I also felt frustrated by the way this scenario combined cards for solutions since it wasn’t described in the rulebook or tutorial. This isn’t the first time I have noticed this in an Unlock! scenario and I’m annoyed that this combination has yet to be referenced anywhere. Significant Changes: There are some big differences related to the amount of time players are given to complete this scenario. Also, players are not given the option to turn off the automatic help for hidden objects in the app. From the get-go, this scenario is incredibly thematic; the time changes are appropriate and work so well with the situation you’re in at the start. I was immersed and found the story elements just hooked me (no pun intended). 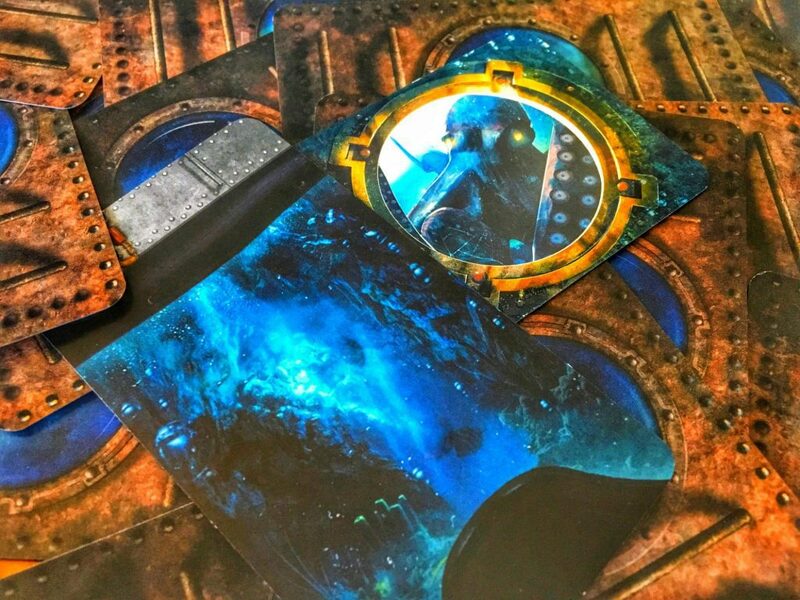 The Nautilus’ Traps began tense and had some difficult puzzles to get through before I was given the chance to stop and catch my breath– literally. 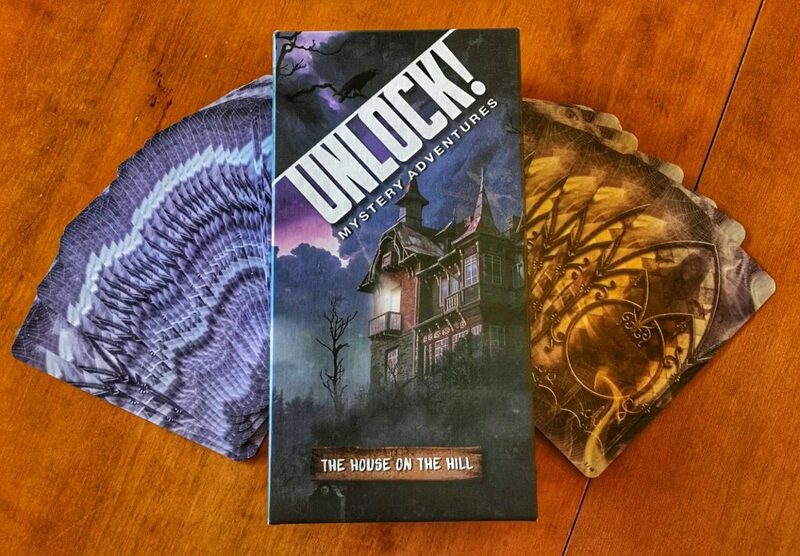 Like The House on the Hill, there was a good blend of hidden objects and puzzle variety. However, unlike the other scenario, there were some neat nautical Machines to manipulate. In general, the scenario’s puzzles are quite difficult. This is partly because of the nautical language used, a fact particularly true for an obscure puzzle near the beginning which suffers from a poor French-to-English translation. To add to the difficulty, The Nautilus’ Traps is chock-full of red herrings. At first, they were quite annoying to deal with, but they quickly became amusing, especially since they made sense thematically. I really liked the scenario and how much it felt like I was trying to escape a terrible underwater trap. Significant Changes: This scenario includes 66 cards (instead of the usual 60) which are shaped differently from other scenarios. The rectangular card shape with no rounded edges is intentional. The Tonipal’s Treasure was a roller coaster of emotions for me; at times it was my favourite and at other times, my least. The negatives boil down to one thing: an inattention to detail when the game was redesigned from its original French to English. There is a puzzle involving a parrot who speaks and gives a helpful clue in the French version. In English, it squawks unintelligibly. After much discussion on BoardGameGeek, there is still no consensus on how the parrot helps solve the puzzle (if he does at all) and what the intention was for the squawks. Yet the parrot plays a crucial role in the French equivalent. A little extra care here would have been appreciated so that both audiences could have a similar experience. Another puzzle later on in The Tonipal’s Treasure uses the metric system. The measurements being used don’t really change how the puzzle is solved, but what is problematic is the typography on the puzzle card, especially for those unfamiliar with the metric system. This makes an already complicated Machine card that much more challenging as players try to understand its symbols. Additionally, there is a key unit of measurement missing from a card. If that wasn’t difficult enough, players should be given a new Object card after manipulating the Machine instead of what is done. Because of this, the BGG community and I thought there was a problem with our game or a bug in the app. If something is that unclear then it reflects poorly on the puzzle’s design. While those were my emotional roller coaster lows, here are my highs. In The Tonipal’s Treasure players make choices that can lead their group on a different path, allowing them to explore a new part of the game. Regardless of their path, they will ultimately still gain the same information as another group, just in a different way. The theme is also strong and really shines through! Who doesn’t want to escape their confinements, defeat an enemy, and race to find hidden treasure? Speaking of treasure, I’m always a sucker for a good ending (even if everything leading up is mediocre) and The Tonipal’s Treasure doesn’t disappoint. I was impressed with the final puzzle and what it added to the experience, but even more so, I was dazzled by the Easter egg ending. Have you ever stayed through all the credits at the end of a movie hoping to see one more scene? In The Tonipal’s Treasure just because the app says the adventure’s over, doesn’t mean it is. If you are willing to put in the work, this Easter egg offers an incredible experience that ties much of the Unlock! series together. It was the first time I truly felt wowed by an Unlock! scenario and I appreciated The Tonipal’s Treasure more for it. Having completed all the escape rooms in my town, I’ve been on a hunt for the perfect tabletop escape experience. Can I finally end my search after playing the Unlock! Mystery Adventures scenarios? Unfortunately, I cannot consider this case closed. While I wasn’t displeased with The House on the Hill, The Nautilus’ Traps, and The Tonipal’s Treasure, I also wasn’t enamoured. The gameplay experiences were enjoyable enough and each scenario definitely improved upon those in the Unlock! Escape Adventures. This leaves me hopeful that the Unlock! system will soon be polished to perfection and I can end my hunt for Red October the best escape-room-in-a-box game.